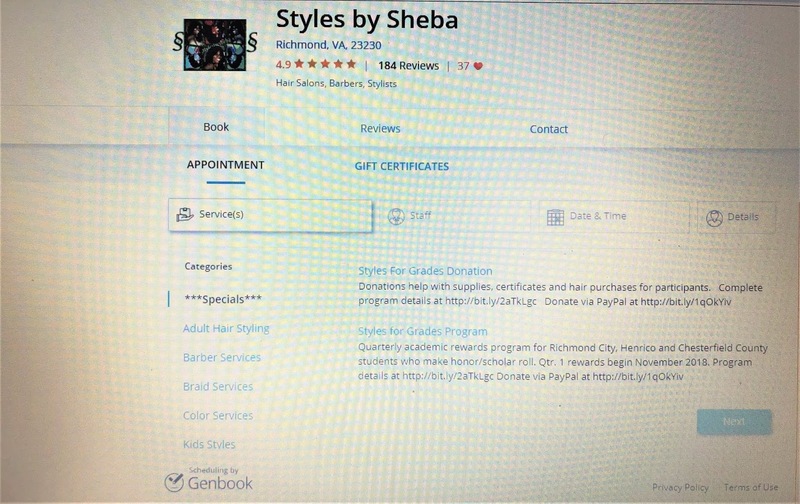 Our online booking service, Genbook now offers the ability to schedule multiple services for one appointment. The combination section will no longer be available due to these changes. 1. 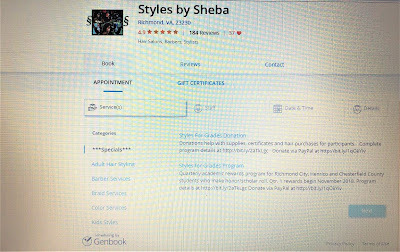 Go to Ms. Sheba's scheduling page on Genbook. 2. Click on the Category for the service(s) you desire to schedule. 3. Choose the first service that you're interested in scheduling. You will see a 1 pop up beside the category where a service is chosen. 4. If the service is in the same category, choose your next service. You should see a 2 pop up beside the category when another service is chosen. 5. If the service is a different category, choose the category for your next service. Choose the service and you should see a 1 pop up next to that category name. 6. Repeat these steps until you have chosen all of your services. Hit the next button at the bottom of the screen. 7. A calendar should come up with available dates and times for the services chosen. Choose the date you would like to schedule for. Please note, if a date or time is not displayed, it is not available. 8. Choose the time you would like to start your appointment time. 9. Enter your contact information. Please note any important notes in the comment section, to include apartment/unit numbers, parking restrictions, etc. If you are registered, choose "Already registered" to login to save your appointment details. 10. If you are a new client, or your service requires payment information, click on Payment Details. 11. Once you have confirmed your payment details, click on Book. 12. You will receive a confirmation e-mail that will include your appointment details. You may cancel, reschedule, or make changes to your services via the link in the confirmation email. 13. I will see you for your next appointment!